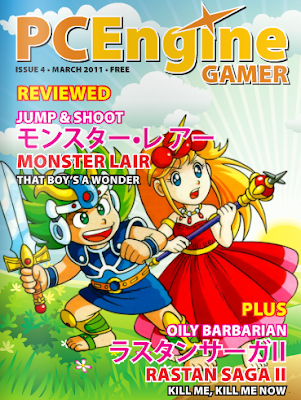 On the hand, I love that the most recent issue--the fourth, for those of you who are counting--PC Engine Gamer is available, free of charge, to anyone who has access to the Internet. On the other hand, I don't love that this online magazine isn't "bathroom friendly," if you get my drift. That's not to suggest I'll be passing on this issue because of the above-mentioned negative. After all, it includes lengthy reviews of Monster Lair and Rastan Saga II, a rather WTF-esque "fight to the death" between Golden Axe's Tyris Flare and Fantasy Zone's Opa Opa, and a "final countdown" column that features the 10 best smart bombs in all of shoot 'em up-dom. Which is to say that this 26-page issue is well worth a few minutes of your time (read it here) if you're at all interested in the system I like to call NEC's little white wonder. You're welcome, Simon! If you're at all interested in the PC Engine, I think you'll like this mag. I especially like the writer's sense of humor.